How Can A Mattress Topper Help? How Do I Care For My Mattress Topper? Hip pain can keep you from sleeping at night, making the hours drag on and affecting your quality of life when the exhaustion is too much. If you’ve upgraded your mattress and still can’t find relief or if you can’t upgrade your bed just yet, it may be time to find a mattress topper to help with the pain. You can’t just buy any mattress topper. You need to look for one for your specific issue. It’s ok if you don’t know where to start. We’ve put together a list of our favorite mattress toppers for hip pain. Plus, we’ve answered a few questions you may have about what to look for and how to care for your topper once you decide. Let’s take a look. Hip pain can have a variety of causes, ranging from mild discomfort to more severe pain. The type of topper you need could depend on the source and severity of your hip pain. For example, if you injured your hip during a soccer game and needed a bit more contouring that’s a lot different than chronic arthritis pain. If you’ve had surgery and required immobilization, that’s different than a bruise. Common types of hip pain include minor injuries such as athletic strains and dislocations. The pain varies from mild to severe and shows up around the time of the injury. If you’ve injured yourself in other areas of your back or legs, you may also be overcompensating and causing strain on the hip joint. Chronic conditions include arthritis and issues with the hip joint’s structure. A significant nerve also runs through the hip, the sciatic nerve, and any kind of alteration to the hip joint can pinch the nerve causing chronic pain. Inflammation is another common cause of pain in that joint. Mattress toppers offer more contouring, allowing the hips to sink further while supporting narrow points such as the waist. Many beds don’t have proper contouring due to age or poor construction, so they force your body to conform to the surface of the mattress instead of the other way around. A mattress topper adds to that contouring layer, which relieves pressure at that common pain point. If you sleep on your back or stomach, you may be putting pressure unknowingly on the hip joint and causing it pain over time. Even back sleepers can sometimes have issues if their back pain is causing peripheral hip pain. A proper mattress topper helps relieve pressure and put the body back into a more natural position without crushing the joint. It can also help you get better sleep overall by cutting down on tossing and turning, which can further irritate the joint. Mattress toppers come in all kinds of materials and purposes, but here are a few things to consider. Memory foam toppers are some of the most common. Memory foam does a great job of contouring to the body, filling in gaps and giving way underneath broader points. Memory foam can retain heat, however, and have an odor. Latex toppers are more natural but still offer the same benefits as memory foam. Natural latex conforms to your body but doesn’t have the same offgassing that memory foam sometimes has. The downside is natural latex is often more expensive than memory foam. Wool is a natural fire barrier and provides extra softness to firm mattresses. Wool stays cooler than other types of toppers, but it can be difficult to find. If you do manage to find one, it’s going to be expensive. Similarly, feathers can also be cool and contouring, but these types of down toppers are also expensive. Polyester blends offer affordable alternatives to other types of mattress toppers. They’re easy to find and come in a wide variety of thicknesses. However, they don’t always last as long as memory foam or latex and often contain materials that may gather allergens. For hip pain, a thicker mattress topper is usually warranted. Look for three to four inches so that you have plenty of contouring. If you’re a side sleeper, the thicker, the better. As you sleep, you crush your hip joint causing pain in the morning, but a thicker topper relieves the pressure and allows you to sleep without tossing and turning. If you’re a stomach sleeper, go with a thinner topper such as two or three inches, so that you don’t force your neck into an uncomfortable position. The topper isn’t usually as bad at stressing your neck and shoulders as pillows are, but a thinner topper is going to be more comfortable. For back or combination sleepers, we recommend testing out a few toppers if you can, but going with three or more inches to allow for different sleep positions without causing other pressure points to pop up. Price is entirely up to you, but it’s our experience that investing in our health and wellbeing is usually worth it. We understand that sometimes budgets can’t be changed, but investing in a well-made product can help you sleep better and improve your overall quality of life. Memory foam is more common now and often comes in options that are more affordable than something rare like wool or feathers. Other considerations would be how much you already spend on doctor’s bills because of your pain or sleeplessness. Investing in a good mattress topper might be able to save you money in the long run if it relieves some of these issues. Most toppers can be thrown in the wash just like any other piece of your bedding. Toppers like latex and memory foam are naturally antimicrobial, so you may not need to wash them as often, but you do need to clean them fairly regularly to cut down on any lingering odors or oils from your body. It’s best to allow it to dry on a low setting to prevent seam issues or breakdown of the materials. If you can hang your bedding out to dry, that can be better although we understand if you don’t have time or space for that. More exotic materials such as wool or feathers may require special care or dry cleaning. Be sure you know what you’re getting into before you decide to go that route. Mattress toppers help protect your new mattress from early wear and tear as well as prevent liquids from seeping into the bed itself. They offer barriers between you and the mattress itself. If you’ve upgraded to a memory foam mattress, for example, but it has an odor, a latex topper gives you some of the benefits of latex without the price of the full mattress. A topper can breathe new life into your mattress and delay the need to upgrade for a little bit while you save up. It can’t help a sagging mattress, but a topper can help give you more contouring for mattresses that have lost overall support over the years. If your mattress is a touch too firm, and that’s causing issues with your sources of chronic pain, a topper could be an excellent way to keep your bed. It will soften the top enough to allow your pressure points to sink while the overall firmness of the mattress supports your weight. If you’ve bought a fancy new mattress with smart tech built in or you’ve gotten one with a cooling layer, a mattress topper could interfere with what the bed is designed to do. Memory foam toppers, in particular, can retain heat and negate any benefits from the cooling layer of your mattress. If you’ve invested in a latex mattress to help cut down on allergies and you don’t get a similarly hypoallergenic topper, it can also interfere with your decision. Toppers like feathers or in some cases, memory foam, can also make it difficult on your allergies despite what your mattress does. Unfortunately, a topper can’t save a mattress that needs to be tossed. If you find your mattress desperately needs to be upgraded because it’s structurally unstable, a mattress topper isn’t going to offer much help. It can enhance the bed you already have, and that’s about it. We’ve put together a list of our favorite mattress toppers for hip pain to help get you started. They’re well made, offer plenty of contouring and support while relieving pressure. Let’s find your newest revolution in sleep. Zinus makes a range of mattresses designed to address sleep issues such as allergies and odor, but their mattress topper is definitely one of our favorites. It features a full four inches of memory foam with both memory foam and a special pressure relieving foam to help remove pressure points. It includes a five-year limited warranty. It uses a new kind of memory foam that reduces the amount of petroleum and replaces it with plant oil for less off-gassing. It includes green tea extract and active charcoal to help reduce odor and provide a cleaner, fresher surface. It’s great for people with allergies and heavy night sweats. It has a mild off-gassing smell and comes completely compressed. You’ll need to allow a few hours for it to air out and inflate before it’s ready to use. Combine it with memory foam or other contouring mattress and alleviate your allergies and pain all in one go. Our runner up is another four-inch gel memory foam queen topper uses a blend of memory foam and down alternative to provide pressure relief. It’s CertiPur-US certified and has better heat wicking abilities than memory foam alone. 2.5 inches of memory foam plus 1.5 inches of down alternative make it one of the more comfortable toppers on the market, especially as a side sleeper. It includes straps to cover the mattress and is completely machine washable, unlike natural down. It has a breathable quilted cover to create loft and air flow while contouring to your curves and supporting gaps such as your waist. It comes with a sixty-day guarantee for you to try the pad out. It’s thick enough for side sleepers to relieve pressure but should still be comfortable for back sleepers, especially if lower back issues is part of your hip pain. The straps keep it in place, which is a nice touch for those of you who tend to toss at night. Revel uses three inches of gel infused memory foam to create a contouring surface that relieves pressure and helps keep you cooler. It’s manufactured in the United States and features a price more close to direct-to-consumer brands. It’s an affordable alternative without sacrificing performance although you do lose an inch of depth. For back sleepers or stomach sleepers, this may not even affect you at all. It uses hypoallergenic memory foam infused with gel to help move heat quickly away from your body and out of the mattress. The cotton cover is breathable and uses fibers reminiscent of down alternative to cool further and encourage air flow. The edges seem unfinished, but it does fit most mattresses well. We’d like to see straps to help keep it in place, but it should stay pretty well with just your sheets. It’s more suitable for back or stomach sleepers, but side sleepers with mild hip pain should still see some relief from pressure points and compression. It’s enough of a reduction in price that you can consider getting two for two different beds, but there’s no reduction in quality. If you need to switch to a hypoallergenic latex topper, the Pure Green is an excellent alternative to memory foams. It features wide channels for better contouring and airflow along with a soft but supportive feel. It’s natural latex with no chemical alternatives. Although there’s no such thing as 100% natural latex, it conforms to standards for natural Latex distinctions with less than 5% additives. It conforms to your curves while staying cooler naturally. It doesn’t have any off-gassing smell and should be ready to use within a few hours of unpacking. Latex is great for those of you with allergies that prevent you from getting memory foam products because of off-gassing. It’s also easier on the environment than traditional memory foam but still offers the same type of support. If you prefer a faster recovery time, it also bounces back just a bit quicker than conventional memory foam. Down alternatives are plush options that won’t aggravate your allergies or cause issues with tactile sensations from feathers, but it can give you that cloud feeling you crave while releasing pressure points. It’s quilted for better loft and airflow so that you stay cooler. It’s hypoallergenic and resists mold and bacteria. It has anchor bands to help secure it to the bed and works best under a fitted sheet or other mattress protectors. It’s not suitable for washing more than once a year, but it should resist odors and other allergens. It’s best for back or side sleepers because it doesn’t offer quite as much contouring as memory foam or latex option. It’s two inches in depth and doesn’t need any airing out. There shouldn’t be any off-gassing or other odors like there is with some memory foam. It comes with a ten-year warranty against mattress defects and abnormal wear and tear. A mattress topper may give you the contouring you need to help relieve pain and pressure on that hip joint, allowing you to sleep better. Investing in tools for your health and wellbeing is always a good choice, especially when something this simple can help you finally get over what’s keeping you from resting at night and fully recovering from an injury or alleviating chronic issues. Get yourself back on track and move on with a topper that can transform your sleep from terrible to recovery. 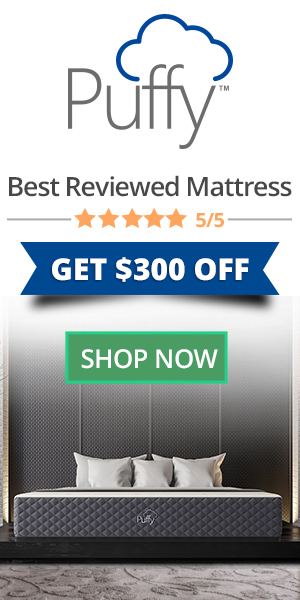 What is the Best Mattress for Heavy & Overweight People?